Unicellular organisms are capable of independent existence and they can perform the essential functions of life. Anything less than a complete cell does not ensure independent living. Hence, cell is called the fundamental structural and functional unit of life. A typical animal cell is bound by a plasma membrane, while cell wall is also present in a typical plant cell. A dense membrane bound structure is present inside a typical cell. This structure is called nucleus. The nucleus contains the chromosomes. Chromosomes contain the genetic material DNA. Prokaryotic Cell: Membrane bound nucleus is absent in prokaryotic cell. Moreover, membrane bound organelles are also absent in prokaryotic cells. Bacteria are examples of prokaryotic cell. Eukaryotic Cell: Membrane bound nucleus is present in eukaryotic cell. Moreover, membrane bound organelles are present in eukaryotic cells. Cells of protista, fungi, plantae and animalia are eukaryotic cells. Prokaryotic cells are usually smaller than eukaryotic cells. They multiply more rapidly than eukaryotic cells. Cell wall is present in all prokaryotic cells. The genetic material is naked, i.e. not enveloped by a nuclear membrane. Genomic DNA (single chromosome/circular DNA) marks the nuclear material. Additionally, there may be small circular DNA outside the genomic DNA in some bacteria. These smaller DNAs are called plasmids. The plasmid DNA confers some unique phenotypic characters to such bacteria. Resistance to antibiotics is one of those characters. 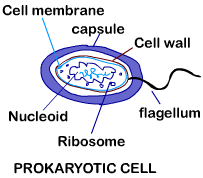 Cell Envelope: The cell envelope is chemically complex in most of the prokaryotes. The cell envelope is composed of three layers which are tightly bound. The outermost layer is glycocalyx, the middle layer is the cell wall and the innermost layer is the plasma membrane. On the basis of differences in the cell envelopes and their response to Gram stain; bacteria are divided into two categories, viz. gram positive and gram negative. The bacteria which take up the Gram stain are called gram positive bacteria. The bacteria which do not take up the Gram stain are called gram negative bacteria. Different bacteria have different types of glycocalyx; in terms of composition and thickness. It could be a loose sheath or could be thick and tough. The cell wall prevents the bacterium from bursting or collapsing. Plasma membrane in prokaryotes is similar as in eukaryotes. Mesosomes: A special membranous structure is formed by the extensions of plasma membrane into the cell. This is called the mesosome. These extensions are in the form of vesicles, tubules and lamellae. The mesosomes help in cell wall formation, DNA replication and distribution to daughter cells. They also help in respiration, secretion process, to increase the surface area of the plasma membrane and enzymatic content. In some prokaryotes, there are other membranous extensions into the cytoplasm. These are called chromatophores and contain pigments, e.g. in cyanobacteria. Flagella: Bacterial cells can be motile or non-motile. Thin filamentous extensions from cell wall are present in motile bacteria. These extensions are called flagella. The bacterial flagellum is composed of three parts; filament, hook and basal body. Pili and fimbriae are also present on the surface of bacteria. Pili are elongated tubular structures made of special protein. Fimbriae are small bristle like fibres sprouting out of the cell. In some bacteria, they help attach the bacteria to rocks in streams and also to the host tissues. Ribosomes: Ribosomes are associated with the plasma membrane in prokaryotes. They are about 15 nm by 20 nm in size. They are made of two subunits; 50S and 30S. These two subunits together form 70S prokaryotic ribosomes. Ribosomes are the site of protein synthesis. Inclusion bodies: Reserve materials in prokaryotic cells are stored in the cytoplasm in the form of inclusion bodies. They lie free in cytoplasm, e.g. phosphate granules, cyanophycean granules and glycogen granules.